Cops: Guy Does $10K in Damage to Wrong House: Ajinka Kelka may be wishing he read the address a little more carefully. The 20-year-old New Jersey man is accused of seeking revenge against his ex-girlfriend's new guy and was allegedly caught on home-surveillance video causing $10,000 in damage to a South Brunswick property—only it wasn't the right house. Check out what he's said to have done. Bathroom Bandit Steals One Thing (and It's Weird): Columbus, Ohio, police are hunting for a man who's been pilfering one type of item from stores, hospitals, and restaurants. Dubbed the Bathroom Bandit, police say he enters various local establishments, visits the men's restroom, and leaves with the stolen goods in his backpack. What in the world could he be stealing from all of these bathrooms? Glad you asked! Man in Hot Water for Teaching Offensive Salute to Dog: There are probably millions of ways you can purposely annoy your girlfriend, but a 28-year-old Scottish man chose the way that got him charged with a hate crime. 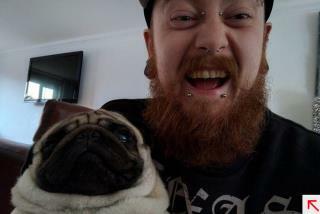 The disclaimer on the video that Markus Meechan posted on YouTube starring his girlfriend's pug notes how she was "always ranting and raving about how cute and adorable her wee dog is," so Meechan decided to make the dog as un-cute as possible. By teaching it to salute like a Nazi. DUIs and Ambulances Go Together Like...: Police say 22-year-old Robert Cordaro Jr. crashed into a flower bed on the University of Rochester campus in the middle of the night in a most unusual vehicle: a city ambulance he allegedly stole. He was charged with grand larceny, criminal mischief, and DUI—and that wasn't the only ambulance-linked DUI incident this week. Bad Speller Busted for Vandalizing Ex's Car: South Carolina's Timothy Trammell is accused of causing hundreds of dollars of damage to his ex-girlfriend's car, but one thing he's not accused of is being a champion speller. A sheriff's deputy says he saw Trammell, 36, spray-painting a car outside a convenience store where his ex works. After briefly trying to flee, Trammell was charged with possession of a controlled substance, possession of marijuana, and vandalism. Check out the photo to see his misspelled message. I dread these 5 story capsules of a capsule articles that come out at the end of the week. They just tell you, Newser will be playing dead for the weekend except for a godawful dribble of drivel. I hope that guy in the UK that was jailed for the pug hate crime, was released..
No, the craziest crime of the week was the videotaped police beatdown of a guy who had surrendered and was kneeling with his hands behind his back. Amazing. Didn't the FBI director just yesterday say police are afraid to make arrests because of video?